Recovery can seem like a long way off, but we’ll help you get there. The Woods at Parkside successfully treats substance abuse and co-occurring mental health disorders using a multi-faceted approach that takes into consideration the uniqueness of each individual. Our goal is to provide clients with the foundation necessary to sustain lasting and meaningful recovery. To accomplish this, our licensed counselors focus on identifying root issues, while engaging clients in an individualized treatment plan to promote steady growth and relapse prevention. 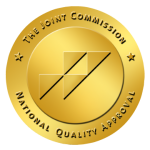 Our treatment center is certified by the Ohio Department of Mental Health and Addiction Services (OMHAS) and accredited by The Joint Commission (TJC). The facility is situated on over eleven acres in a quiet, residential neighborhood and complete with a serene view overlooking a golf course. We are ten minutes from Port Columbus International Airport and within a convenient driving distance to most areas in Ohio, Western Pennsylvania, and Michigan. If transportation is an issue, our staff can accommodate by both picking up, and dropping off clients. Please note: For medical emergencies, please call 911. For other urgent matters, please call our admissions line (614) 471-2552. Submissions after-hours, weekends, or holidays may experience a longer response time. Parkside definitely saved my life! I met wonderful people there, that I will never forget such as other patients & staff members. Without the wonderful group of people that were there for me & with me, I don’t know what I would have done or how I would have gotten through my days there. The people definitely made it possible and A LOT easier than it would have been if I tried to do it alone! Parkside was my saving grace when entering recovery. Majority of the staff is caring with an awesome sense of humor and humility. The clinicians are attentive and a special recognition should go out to my counselor, Tim G who has forever impacted my life. The food is edible and they have recently implemented various activities in with their traditional 12 step group therapies. Parkside is not without flaws, but is ever evolving. Just like most things in this world, you will most certainly get out of it what you put in to it. Go in with an open mind and a willingness to change, and Parkside will help you do the rest. Who can refer someone to The Woods at Parkside for treatment? We invite referrals by medical caregivers, case managers, employee assistance programs, family members, community agencies, hospitals, clergy, friends and patients themselves. If you would like further information, call our admissions department at 614-471-2552. What should I bring with me to The Woods at Parkside? Will my insurance company pay for dual diagnosis and/or mental illness treatment? The Woods at Parkside works closely with patients, their families, agency representatives, insurance companies, employee assistance programs, and managed care providers to determine all payment options. The Woods at Parkside will accept direct payment on fees for individuals who do not want to use insurance or have no insurance coverage available. We are an approved provider for most major insurance companies and managed care plans. Please feel free to call our admission department for further details at 614-471-2552. What are your visiting hours and family group / session times? Individual Family Sessions – Anytime, scheduled with therapist, family, and client. For more information on substance abuse please visit the Substance Abuse and Mental Health Adminstration’s website. The Woods at Parkside complies with LegitScript’s certification standards, which help ensure transparency and compliance with applicable laws and regulations.